As early as 1530, there are documents concerning a so called "convivium musicum" in Frankfurt, where friends gathered to be merry and to make music together. The latin term can be translated as musical banquet or symposium. 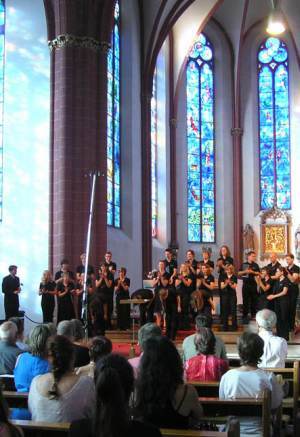 With this ancient idea of combining musical studies and the joy of friendship and music itself in mind, the convivium musicum mainz was founded in 2003 as choir of the institute of musicology of the Johannes Gutenberg University in Mainz. Since then the young choir counts about 25 members and works on a repertoire of sacred as well as secular music from the renaissance to modern times, always focusing on musical accuracy and precise interpretation. Convivium musicum mainz regularly gives concerts in Mainz and the Rhine-Main region. In a series of charity concerts in 2005, the choir together with the ensemble "Taquikuna" collected money for the victims of the Tsunami in Sri Lanka. With the money collected a school was built which today is called the "convivium musicum mainz school". In May and June 2006, the choir toured through Latvia with the program "Cantus Gloriosus". Following the tour through the south of England in summer 2012, the choir will contribute to the summer school of music "International Campus Musica" (ICM) in Polignano/Italy as "coir in residence" in 2013. 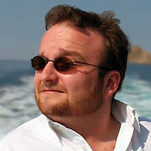 Since November 2007, the tenor Danilo Tepsa is the conductor of convivium musicum mainz. Under his leadership, the choir has given a series of successful concerts including the so called Vespers of 1610 by Monteverdi, an anniversary programme with pieces by Haydn, Purcell, Mendelssohn and Handel in 2009 as well as christmas and new year's programmes with English and French choral music. In the following concerts in 2010 and 2011, works by Johannes Brahms and pieces from the renaissance to modern times - from Lechner to Eric Whitacre - merged into a programme rich in contrast. The spring 2012 programme consisted in Latin American and Spanish music, including Ariel Ramírez's "Misa Criolla", and it was performed again together with the ensemble "Taquikuna", resembling the successful concerts from 2005. Our 2012 programme focused on sacred music from the period of Romanticism, mostly by English composers, such as Charles Villiers Stanford, William H. Harris, E. W. Naylor and John Ireland. Henry Purcell and Felix Mendelssohn Bartholdy completed the repertoire. In Summer 2013, the choir toured through Puglia (Southern Italy) and held several concerts, including in Bari and Monopoli. In November 2013, convivium musicum mainz celebrated its 10th anniversary with a jubilee concert and festivities. In March 2014, convivium musicum won the Rheinberger Video Contest initiated by the Carus music publishing company on the occasion of the 175th birthday of the well-known choir composer, Josef Gabriel Rheinberger. In August 2016, the choir accompanied a European art project of well-known artist Dries Verhoeven at Wiesbaden Biennale 2016. Danilo Tepsa studied classical singing and master of musical arts at the university of Mainz, where he presently holds a lectureship on Early Music and Vocal Ensemble. He has taken master classes i.a. with Céline Dutilly, Georges Delnon, Cornelius L. Reid and Claudia Eder. As concert tenor with a broad repertoire ranging from music of the renaissance to premieres of contemporary music, as cembalist, organist and choir conductor, he is well sought after and works throughout Germany with his focus on the Rhine-Main-region. Following invitations to temporary engagements, he has sung at the Städtische Opern Münster, the chamber opera Rheinsberg, the Hessisches Staatstheater Wiesbaden, the opera Frankfurt, the Young Ensemble of the national theatre Mainz and the national theatre Mannheim. In 2007 he made his début at the Salzburg festival. Following his engagement as permanent ensemble member at the national theatre Koblenz up to 2012, he is currently a member of the WDR Radio Choir Cologne. You can listen to some audio samples of our choir, recorded at different concerts in the last years. Please note that the linked page is in German, but you will find the audio samples by just clicking on the titles of the concerts, works and pieces. Enjoy!